Today’s post is from Marie-Claude Leroux of Marie’s Pastiche. She is a French-Canadian blogger living in Nova Scotia and writes about exploring world cultures with kids. This year her family took on the mission of learning about Lebanon, making her addition of lentil soup for this project a perfect fit! 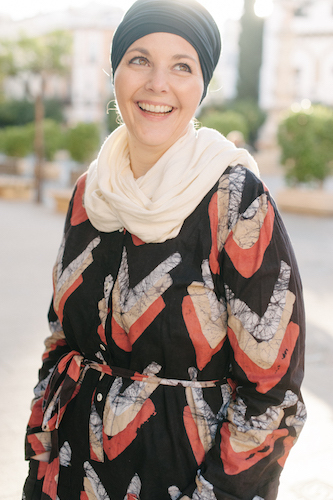 You can connect with her on her website, Facebook, Twitter, Pinterest, and Instagram. Our family has been virtually exploring a country (or region) and its culture every year for ten years. This year we headed to the Middle East to spend some time exploring Lebanon. Since we know little about Islam, this has been a great opportunity to learn more about the religion, and by extension Ramadan. While learning about the importance and meaning of Ramadan, we are also learning about some of the Lebanese customs associated with it – which, among other things, brings us to food. 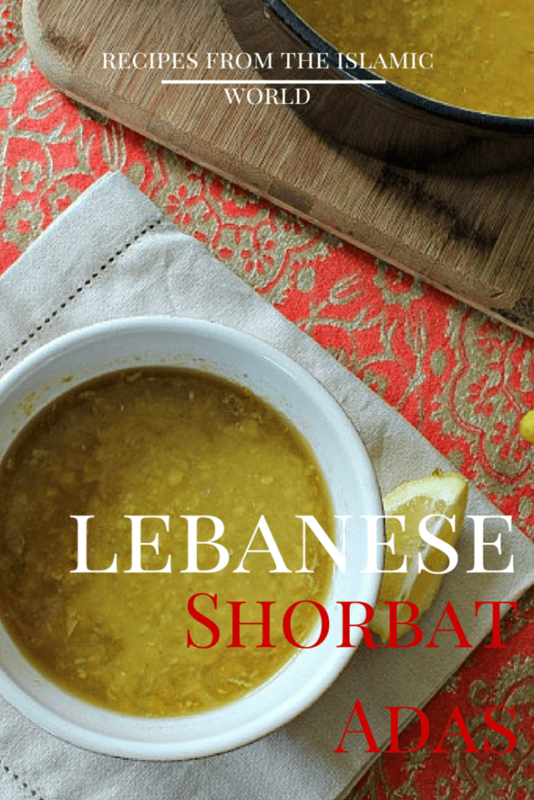 A common household dish to break the fast at the end of the day in Lebanon is shorbat adas – lentil soup. This soup is often the first course of iftar when eaten at home and it is delicious! This is a simple soup, but don’t be deceived – it’s quite flavorful. 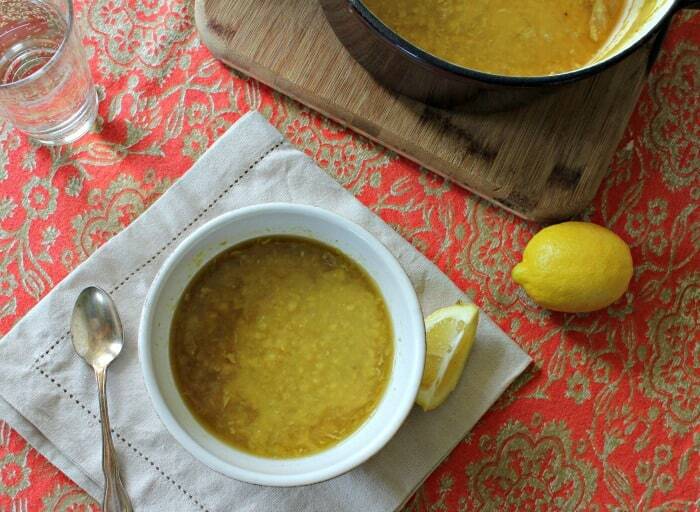 The key is to add a squeeze of fresh lemon juice into your bowl of soup before eating it. My daughters were dubious when presented with lentil soup, but found it quite tasty. We will definitely be making this again. It’s pretty filling, so you only need a little as a first course. With pita bread on the side, it would make a great lunch. 1. Heat oil on medium low, then add onion and cook until soft, stirring so they don’t stick. 2. Once the onions have soften, add the garlic, cumin and turmeric and cook while stirring for another minute. Add the stock and bring heat up to medium-high. 3. Rinse and drain the lentils, then add them to the soup. Once the soup comes to a boil, reduce and simmer for approximately 35 minutes. 4. Serve with salt & pepper to taste, and a wedge of lemon – be sure to squeeze that lemon into your soup! Lovely recipe, I tweaked it a little by gently frying the lentil with the onions, garlic and spices for 10 minutes before adding stock for added flavour. I lived in Marrakech for 6 months, and really miss the gorgeous smells and colours of the spice markets. My absolute favorite soup! This is a great recipe the only change I make is I use Olive Oil and a whole onion instead of half. Great job! Made this w tricolor sprouted lentils (no rinsing and fast cooking and healthier for digestion) Used ghee and coconut oil (I don’t use vegetable oil) and added celery and carrots before the onion and garlic. I liked the idea of cumin and turmeric. Used my homemade chicken stock. I partially pureed it w my stick blender after it was cooked to thicken it. added splash of raw vinegar instead of lemon in serving. easy, quick and tasty. traditionally baked sourdough bread on the side. This is one of my favorite soups! I love that your family “travels” to a different country each year, Marie-Claude. What a great idea and learning adventure!